If you are looking for solidly acted, and a polished looking, action thriller, Mile 22 should satisfy; besides it’s always fun to watch some knuckles get bloodied, and shiny things go boom! When Mark Wahlberg and Peter Berg work together we, the moviegoers, are undoubtedly prepared for a fast-paced and excitement-filled movie ala Deepwater Horizon and Lone Survivor. We are also likely to be treated to an action film that is able to connect its characters to the audience. Mile 22 delivers an action-centric, yet, otherwise, flawed, thriller. The film's taught, and tense opening sequence belies the rest of the movie's performance, never living up to the expectations set in the first 20 minutes. We are introduced to James Silva (Mark Wahlberg- The Departed, Boogie Nights) and his Second in Command, Alice Kerr (Lauren Cohan- The Walking Dead, Supernatural). After a quick backstory, explaining the recruitment of the bright yet angry young Mr. Silva by the CIA, we learn the premise of the film from the inimitable John Malkovich, portraying the Overwatch Leader, Bishop. An elite paramilitary team called Overwatch is tasked with transporting a police officer (Iko Uwais) with vital information about a potential terrorist attack 22 miles across Southeast Asia from the American embassy to an airfield. With the help of high-tech communications expert Bishop (John Malkovich) and second-in-command Alice (Lauren Cohan), leader Jimmy Silva (Mark Wahlberg) and his team must outrun local military, police and gang leaders to complete their mission. At just over 90 minutes, the film desired to deliver a taut, action thriller but falls a bit short in many of its intended targets, including providing us with characters that we can connect with. Being the first part of a three-part film series, this could have been on purpose to leave the backstory for part 2. Unfortunately, there's not enough time spent getting to know the characters. Even after seeing Lauren Cohan's troubled relationship with her ex-husband and her separation from her daughter, at the end, after almost being killed, bringing Iko Uwais safely to the airport, she is told by Wahlberg to "Go be a Mom for 6 days" She replies, "I'll be back in 5." Really? Mother of the year, in training. What is a bit upsetting is the limited use of Iko Uwais (Raid: Redemption, Star Wars Ep 7) martial art skills. His frenetic, explosive martial arts choreography was so heavily edited it looked amazing but not spectacular. While most of the fight set pieces were well choreographed by Iko Uwais they left us with a feeling of what-might-have-been. It isn't an entire loss. Mile 22 provides standard action fare, with a bit of an unforeseen twist, and leaves off with the promise of a continuation, which we may never see, given the lackluster box office. Hopefully, it will do better in the home market and we get to see a sequel sometime soon. The Universal Blu-ray provides us with an MPEG-4 AVC 1080p resolution and it looks great. The environments are sharp, even in the dimly lit interiors of the apartment building sequence; through the smoke and gunfire, we are treated to great clarity, especially up close fight scenes, the blood and drops of sweat seem ready to roll off the screen. What is a very nice surprise is when you redeem the digital code (iTunes Only) for Mile 22 you get the 4K version digitally. The audio, while not Dolby Atmos, is DTS-HD Master Audio 7.1 lossless, and provides a solid atmosphere for an active playground. Explosions, gunfire, even the conversations in the Overwatch Command, as well as the Russian ops center, all provide a vibrant, rich tapestry, which plays well in surround sound. The extras are short (none over 4 minutes in length) and to the point and lack the depth of many other special features we come to expect from a major studio release. A few of note are Overwatch, Introducing Iko Uwais, and Iko Fight. It was also interesting to see how Columbia doubled as the Far East. I really enjoy his other films and was looking forward to seeing him unleashed here. His talents are a bit hampered by the quick edits, but if you are a fan, you will appreciate him in this movie. All in all, Mile 22 is a flawed, but fun action film. It could have used another 20 minutes to develop the characters and elaborate on the plot. Mile 22 doesn't deliver Jack Ryan or Jason Bourne but if you are looking for solidly acted, and a polished looking, action thriller, Mile 22 should satisfy; besides it's always fun to watch some knuckles get bloodied, and shiny things go boom! Here's hoping for Mile 22 Part 2 and Raid 3! 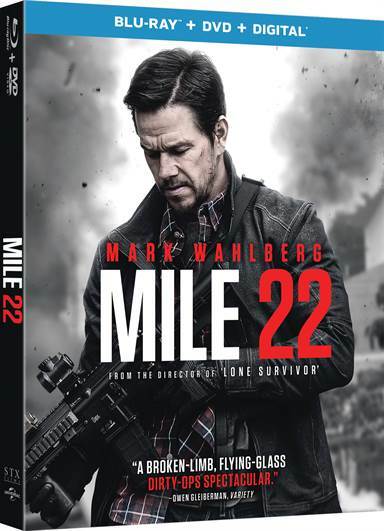 For more information about Mile 22 visit the FlickDirect Movie Database.